Small autograph album that belonged to May Gertrude Benson of Manchester, New Hampshire. 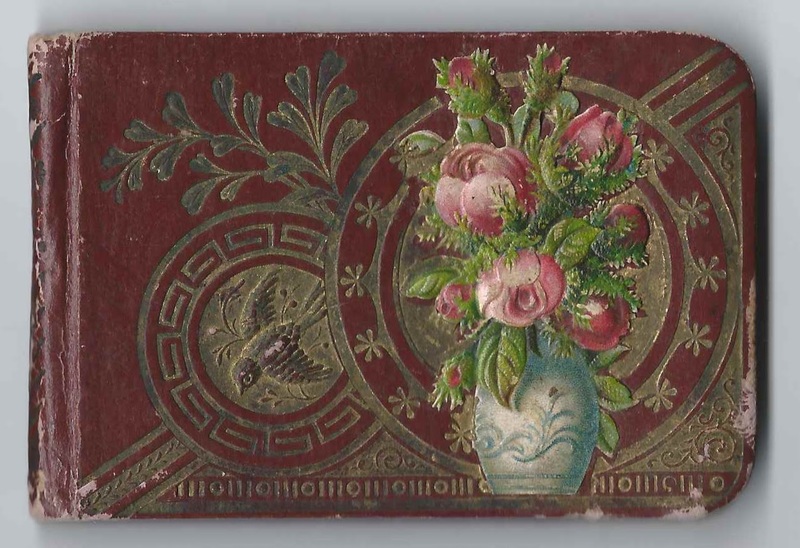 The album is a bit smaller than 4" x 2-3/4" and contains the sentiments of over thirty of May's relatives and friends. The number could be higher as people of the same name signed several pages, but they may have been different people. An alphabetical list of the signers appears at the end of this post. Most hailed from Manchester, New Hampshire, Auburn, New Hampshire, and Massabesic, New Hampshire, from the greater Manchester, New Hampshire, area. May Gertrude Benson was born at Bow, New Hampshire, on 24 July 1876, the daughter of James B. Benson, Jr., and Sarah Elizabeth (Fox) Benson, who were born at Bow, New Hampshire, and Auburn, New Hampshire, respectively. 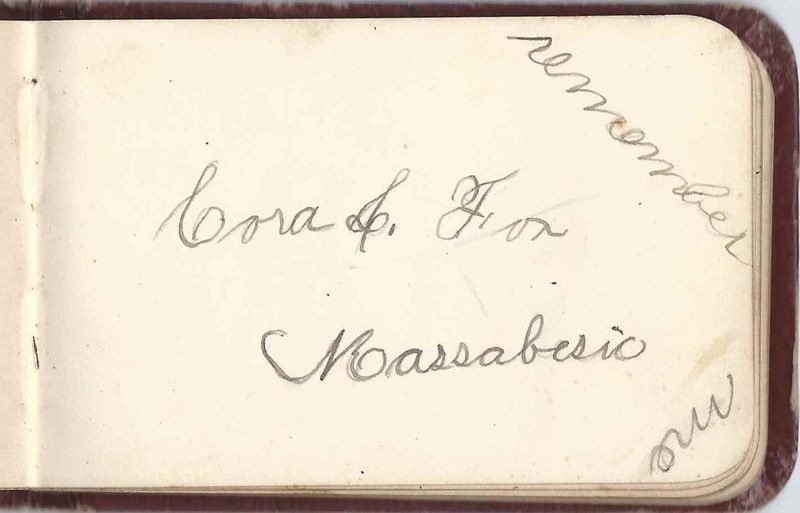 May's mother, Sarah Elizabeth (Fox) Benson, signed a page in the album on January 19, 1884. 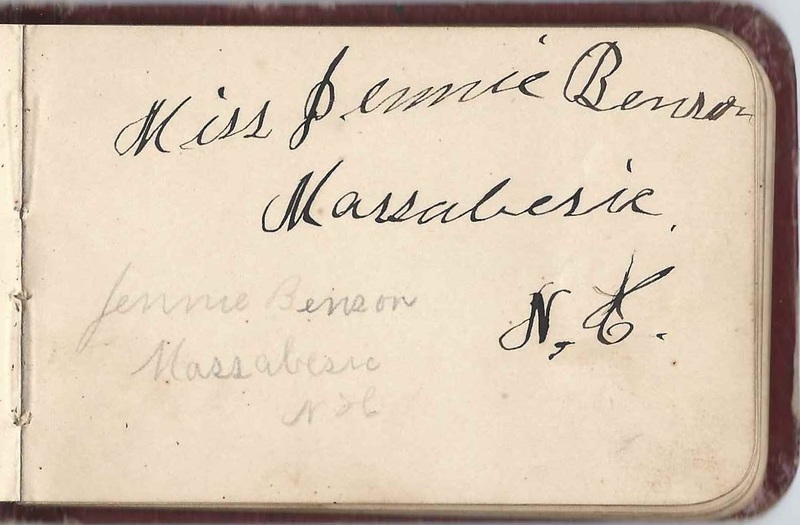 It's likely that the Jennie Benson who signed was May's older sister Jennie E. Benson, who would later marry Charles Henry Grant and have three children with him. 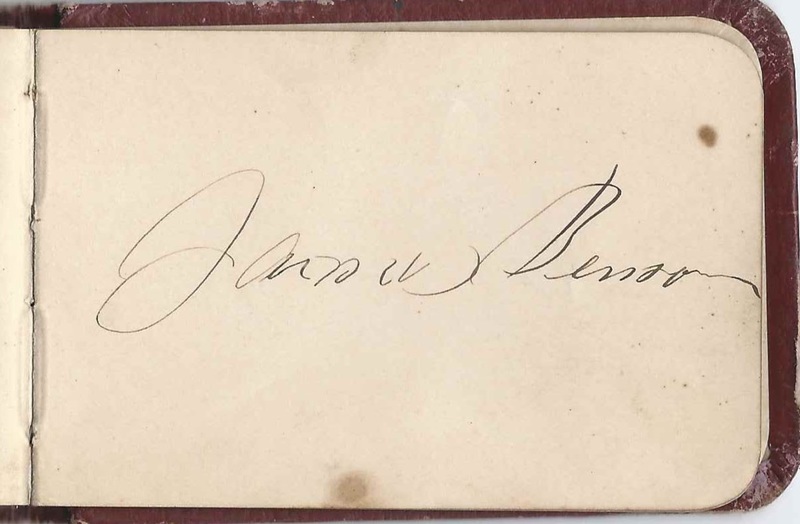 It's possible that the page below was signed by May Gertrude Benson's father, James B. Benson, Jr. The nickname "Grettie" occurred in at least two generations of Fox/Bensons. The first usage I could find was for May Gertrude Benson's maternal aunt, Margaret Alida Fox. There were three pages signed by a Grettie Benson. It's possible that Grettie was May's younger sister Margaret A. Benson, who would have been a baby during the era of the autograph album but whose hand, I believe, was guided by that of an adult. 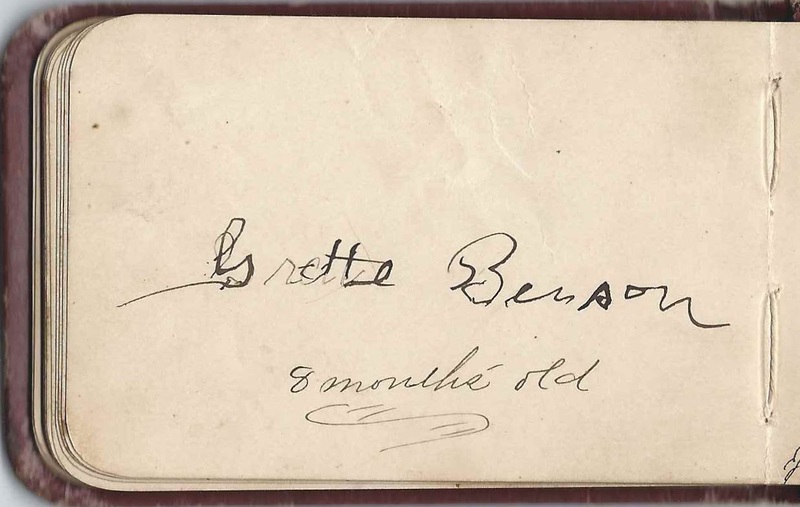 One page notes that Grettie is 8 months old, so that accounts for at least one of the pages signed by "Grettie" Benson, and possibly all three. On 13 June 1900 at Manchester, New Hampshire, May married widower Dr. Daniel Simmons Adams, son of David and Delia M. Griffith Adams of New York. Daniel Simmons Adams was born 3 May 1846 at Lockport, New York. The Genealogical and Family History of the State of New Hampshire, Volume I, published in 1908, and edited by Ezra S. Stearns, has information on him and his family. Dr. Adams' first wife, Cora Ann Fox had died in 1898. Cora Ann Fox was a sister to album owner May Gertrude Benson's mother, Sarah Elizabeth (Fox) Benson. One of the signers in the album, Cora Louette Fox, was likely named after her aunt Cora Ann (Fox) Adams. Dr. Daniel Simmons Adams died in 1907 at Manchester, New Hampshire. On 1 July 1914 at Manchester, New Hampshire, May Gertrude (Benson) Adams married William Bernard Severance, son of Harvey and Hortensia N. (Smith) Severance. William was born 10 August 1882 at Auburn, New Hampshire. I'm not sure if May Gertrude (Benson) Adams Severance had any children. None are listed with her at the time of Census enumerations. Nor did Dr. Adams have any children with his first wife, May's aunt. Bernice. Possibly the daughter of signer Mary Grace (Fox) Richardson, sister of album owner May Gertrude Benson's mother, Sarah Elizabeth (Fox) Benson. If so, she signed another page with her father Samuel Richardson. May Gertrude Benson of Manchester, New Hampshire; album owner; she wrote her name on two pages. Daughter of James B. Benson, Jr., and Sarah Elizabeth (Fox) Benson. 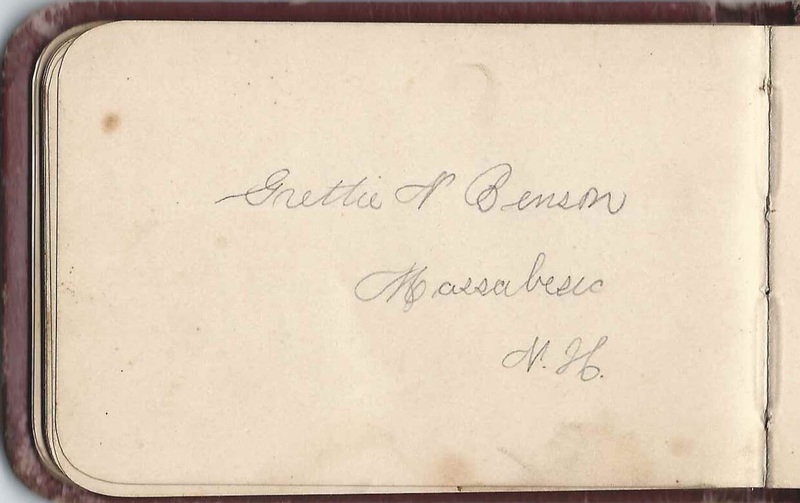 May Gertrude Benson is presumably the Grettie Benson of Massabesic, New Hampshire, who signed another page, but I'm not sure which name she went by. Grettie Benson of Massabesic, New Hampshire; middle initial possibly A or N. The nickname "Grettie" was given to May Gertrude Benson's aunt Margaret Alida Fox, "Grettie". It's possible that album owner May Gertrude Benson's younger sister Margaret A. Benson was named after her aunt and acquired the nickname as well, but she would have had to sign the page in an era after the 1880s, as she wasn't born until 1884. Or the nickname was given to cousin. Or the nickname was given to May Gertrude Benson herself. There's another page signed by Grettie Benson at age 8 months, and the handwriting looks like what you'd imagine if someone guided a baby's hand. Given name hard to decipher, but possibly James Benson. If so, he may have been album owner May Gertrude Benson's father, James B. Benson, Jr.
Grettie Benson, 8 months old. Looks like the kind of handwriting you'd expect if someone was guiding a baby's hand. Possibly album owner May Gertrude Benson's sister Margaret A. Benson. There's another similar page. 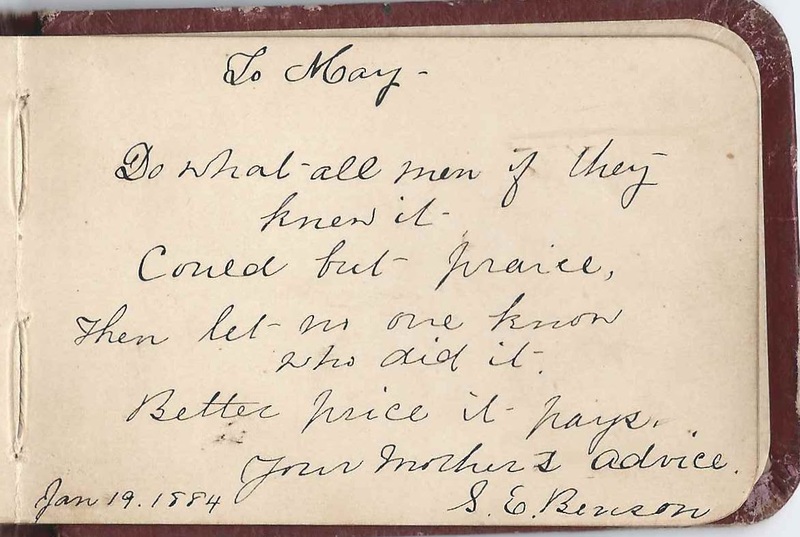 S. E. Benson, signed January 19, 1884; album owner May Gertrude Benson's mother Sarah Elizabeth (Fox) Benson. 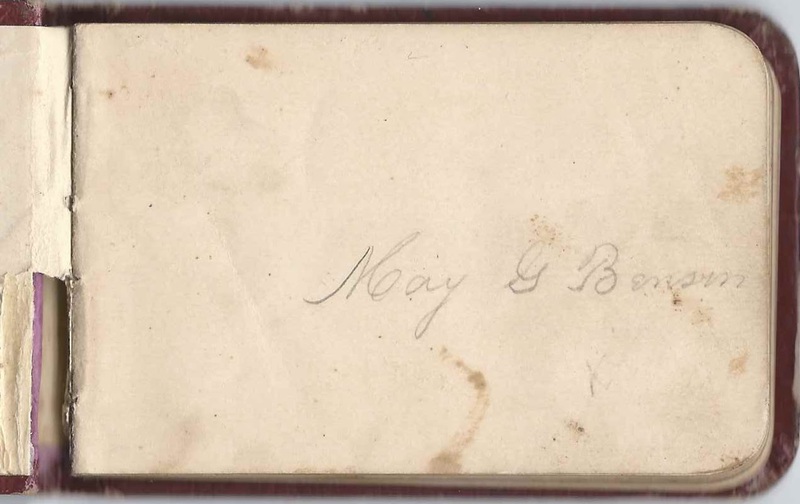 Emma J. Bullard of Massabesic, New Hampshire, signed January 28, 1884. Presumably the Emma J. Bullard who was the daughter of George W. and Angeline A. (Davis) Bullard and future wife of Elmer E. Reed. Cora L. Fox of Massabesic, New Hampshire; Cora Luette Fox, daughter of Franklin Andrew Fox and Inez Louette (Pollard) Fox and sister of signer Ruby Inez Fox. Martha Newton of Manchester, New Hampshire, signed on March 23, 1886. 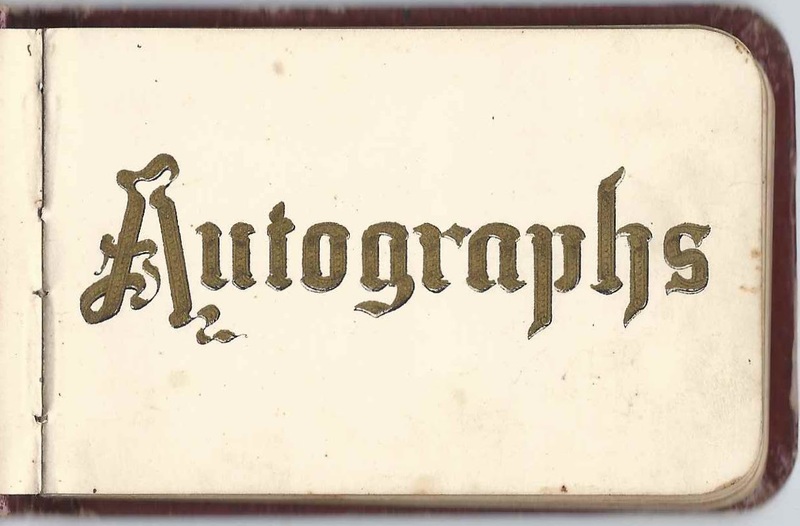 Mary G. Richardson of Auburn, New Hampshire, signed on February 8, 1884; aunt of album owner May G. Benson. I believe she was Mary Grace Fox, a sister to May Gertrude Benson's mother, Sarah Elizabeth Fox. May Grace Benson married Samuel Richardson. Bernice M. Richardson; album owner May Gertrude Benson's cousin. She was the daughter of May's maternal aunt, Mary Grace (Fox) Richardson and husband Samuel Richardson, who also signed the page. Samuel Richardson, uncle of album owner May Gertrude Benson; husband of May's maternal aunt Mary Grace (Fox) Richardson. 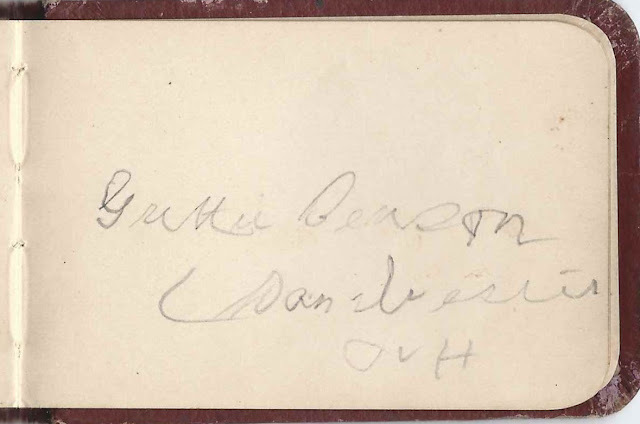 His daughter Bernice M. Richardson also signed the page.